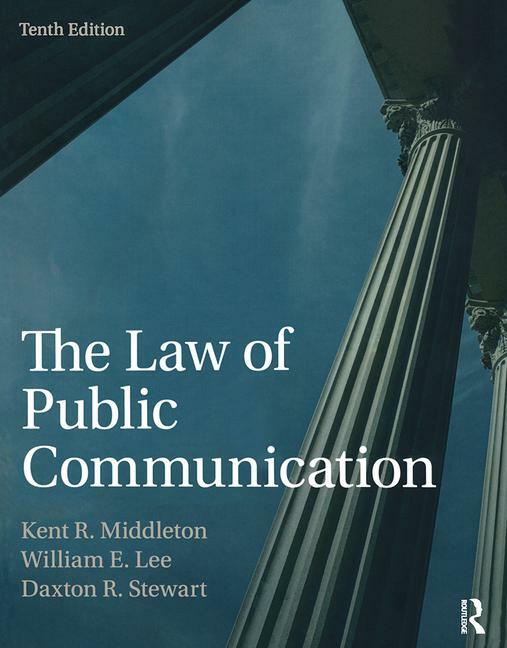 Now in its tenth edition, The Law of Public Communication provides an overview of media law that includes the most current legal developments. It explains the laws affecting the daily work of writers, broadcasters, PR practitioners, photographers, and other public communicators. By providing statutes and cases in an accessible manner, even to students studying law for the first time, the authors ensure that students will acquire a firm grasp of the legal issues affecting the media. This new edition features color photos, as well as breakout boxes that apply the book’s principles to daily life. The new case studies discussed often reflect new technologies and professional practices. Kent R. Middleton is Professor Emeritus of Journalism at the Grady College of Journalism and Mass Communication, University of Georgia. William E. Lee is Professor of Journalism at the Grady College of Journalism and Mass Communication, University of Georgia. Daxton R. Stewart is Associate Dean and Associate Professor at the Bob Schieffer College of Communication, Texas Christian University.